Ploprof 316 Reform 'SHARK' Mesh Band was inspired by the original Omega Seamaster 600m Ploprof mesh band. 316L stainless steel wire enhances the best performance of assigned finishing. 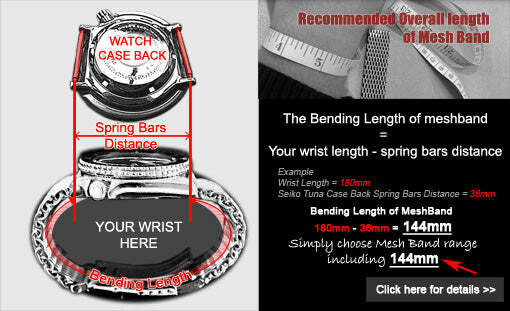 Approximate 4mm thick, smoothly bend on your wrist. The improved technique of polishing turns the mesh surface into absolute flat. This is a sturdy but comfortable Milanese watch bracelet. Accompanied with brand new Submariner double locks diver's clasp made from solid 316L stainless steel with extra 6 micro holes for flexible fine tune length adjustment. Submariner double locks diver's buckle is ideal for watch band with thickness approximate 4.0 - 5.0mm.